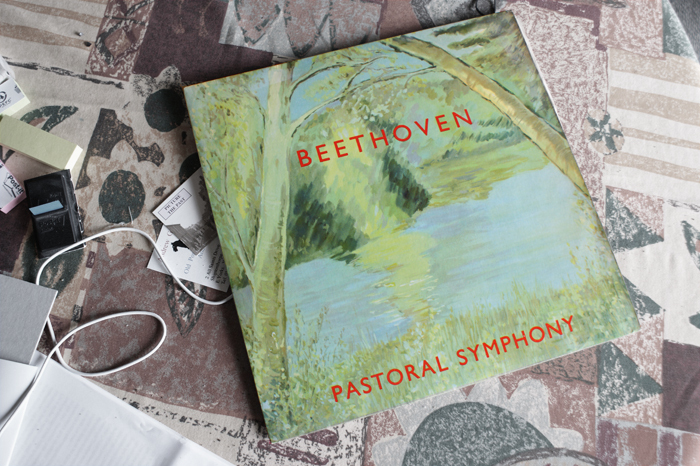 A really curious amateur landscape cover painting here for this release of Beethoven’s Pastoral, perhaps even specially commissioned. I spotted it in a charity store and having been looking at a gallery of David Hockney’s tree paintings the other day it just appealed as the antithesis of so much high end art when I found it. Nobody is named as the artist although one Valerie Bennett is given a design credit, which probably means she was the painter (why would you credit the designer but not the painter? The sleeve note writer probably didn’t know the difference). It looks like the sort of amateur work you see done on the back of a piece of hardboard hanging at the local art group show. This low budget feel is entirely appropriate as the album is from the cheapo Summit label which operated in the UK during the early 1960s. Deutsche Grammophon they weren’t. The LP is dated 1962 although we’ve no way of knowing when it was recorded. The painting is set off by a nice bit of bright red Gill Sans for the titles when you might expected a cheesy flowing script of some sort.